No, not a record low pressure this one but the stormy weather continues for the UK with another deep area of low pressure sweeping up past the NW of Scotland tomorrow, Friday. This one, called Anne, has violent storm force westerly winds out in the Atlantic building high waves and matching high tides, causing unusual storm surge conditions for the west coast. It is the orientation and track of this storm that appears to be causing most trouble: spot those isobars directed straight at the UK and building high seas with those high tides. The distance which wind travels over the sea is called FETCH and the longer the fetch the greater the possible wave height. Note also the waves and wind that build in the Channel. There are currently 17 severe flood warnings from the Environment Agency for the west coast of Wales and SW England. The River Severn estuary is also at risk as as it faces the SW winds, funnels tides and has high river flows all to contend with. Envt Agency are even warning people to evacuate if possible from vulnerable locations on West coast. N Ireland also adopting this too. For Reigate and the SE (inland) heavy overnight rain will pause for a while in the morning only to resume as winds increase to gusts possibly 30-40mph, gusting higher on hills, and with possible heavy showery rain. Rain totals for Fri-Sat 48 hours could amount to 30-40mm, but more likely 10-20mm for Reigate and Mole Valley. Is there any sign of improvement? Met experts watch the high atmosphere for some long range forecasting. In particular, the stratospheric Polar Vortex is a a possible indicator of how the tropospheric jetstream might be acting in weeks to come. The stormy weather we have been experiencing has been “caused” by an extremely powerful polar vortex: a great contrast in temperature difference between high and low latitudes sets up high winds in the stratosphere which act like a belt to hold in cold air to the Pole. 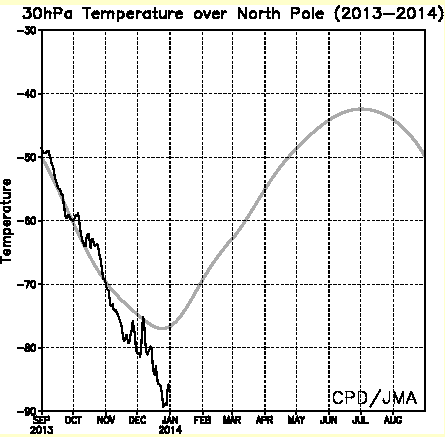 The North Pole stratosphere is extremely cold this winter and this has encouraged a powerful polar vortex. 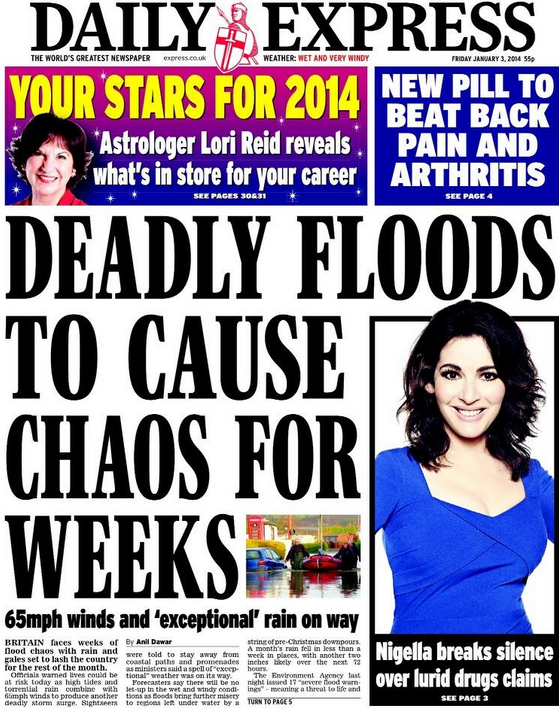 Finally, the Express is unusually conservative with this article: the wind speeds are too low!